Joe Womack, Africatown C.H.E.S.S. Clean, Health, Educated, Safe & Sustainable, Inc.
How will you prepare the Mobile Bay area for the impacts of climate change (rising sea level, increase in vector-borne diseases, more frequent and higher intensity storms, etc.)? How will you transition the Mobile Bay area off of fossil fuels into renewable energy resources? How will you increase local spending into renewable energy? What is your plan for replacing the jobs that will be lost in the necessary and urgent switch to less deadly forms of energy? 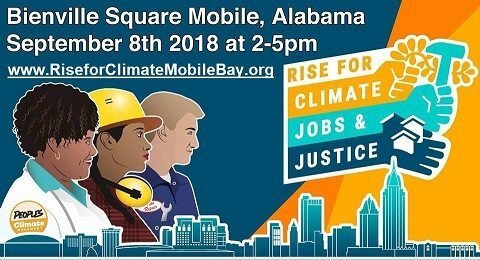 Rise for Climate, Jobs, and Justice – Mobile Bay is a sister event to the National Day of Action, Saturday September 8th with The People’s Climate Movement. In Mobile, we want to “bring home the real and expected impacts of climate change this community will face.” This event will 1) highlight the local issues all Mobile community members will face as climate change worsens, 2) identify the local barriers to switching from fossil fuels to cleaner renewable energy resources, and 3) begin mass mobilization in Mobile in order to transition into clean energy and reduce the greenhouse gases we cause as a result of our business and money decisions. We believe the biggest ways our Mobile community can adapt to climate change and fight back against it are electing local politicians who promote investment in renewable energy resources and promote stronger and more robust public transit systems.